Following up on the first two postings in our Money on the Table series (Part 1, and Part 2), the following email message was sent to City Council Members this afternoon (May 27), via City Clerk Chuck Thorne, along with a chart labeled Rush Street’s Giveaways. (click the link for a pdf. version, or the image to the right for a jpg. version). 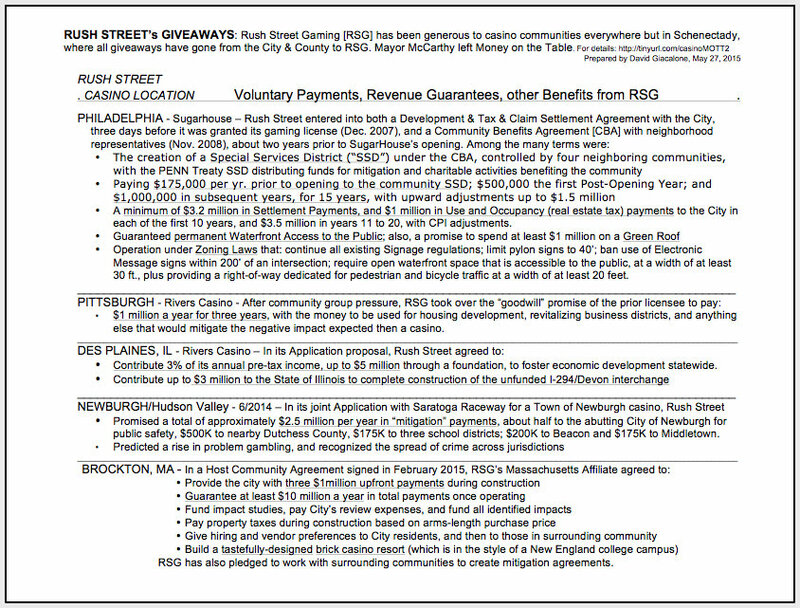 The Chart shows the many benefits Rush Street Gaming [RSG] has bestowed on each of its other casino communities, in commitments made prior to opening, while offering none to Schenectady. We believe Mayor McCarthy has left Money and More on the Table in its dealings with RSG and the Galesi Group concerning Rivers Casino at Mohawk Harbor. which neighborhood and community projects could have been funded with an extra $1 million, or even $100K, payment this year and next year? has the City lost all leverage with RSG, or are there still things the Casino needs from the City or its residents that might inspire RSG to offer “goodwill” payments? The Mayor referred to the Stop the Schenectady Casino website as “that blog” at the last Council meeting, and suggested the website has misinformation. I assure you that we’ve always done our best to present the facts and objective reading of laws concerning this Casino, and have often been the only source in this City for any stories, research, facts, etc., that show the casino or RSG in a bad light, or that even ask that the City Council and Mayor do some homework and stop to fully consider issues. We will correct any factual mistakes, if they are pointed out. Please feel free to contact me with any questions and comments. This entry was posted in politics, Schenectady Casino and tagged Rush Street Gaming, Schenectady Casino by David Giacalone. Bookmark the permalink.